Frank Ocean—the multi-talented singer, songwriter, and rapper—eschews the R&B label his music is traditionally given and references genres as varied as electronica, psychedelic rock, and hip-hop. After releasing 2012’s Channel Orange to critical acclaim, Ocean was quiet for four years, until he put out Blond in 2016. His distinctive sound draws on a wide range of influences, collaborators, and sound sources. And his often digitally manipulated vocals are accompanied with samples, synthesizers, live musicians, ambient dreamscapes, and a slick production style to tie it all together. I'm going to explore the various electric piano, synthesizer, and other keyboard sounds on both albums, and show you how recreate them using software synths. Frank has worked with many big names throughout his career. For his debut album, the production duties were shared by Ocean, Malay, Om'Mas Keith, and Pharrell Williams, with all the synths and keyboards on that album credited to them. Malay likes to use a Moog Voyager and Arturia software synths, which he likes to run through outboard gear to make them sound more "real." Blond saw the addition of many more collaborators (69, according to the album credits), including keyboardist Buddy Ross and Jon Brion. Ross has been Ocean's live keyboard player since 2012, and he contributed synths to several tracks from Blond, including "White Ferrari" and "Nights." The instrumental backing for "Be Yourself" and "Facebook Story" also comes from Buddy Ross, which I'll dive into shortly. Jon Brion is a composer/producer revered for his soundtrack work on movies like Eternal Sunshine of the Spotless Mind, as well as for working with artists such as Kanye West on Late Registration, Fiona Apple on When the Pawn…, and Beyoncé on Lemonade. According to the album credits, Brion contributed string arrangements, keyboards, and production to several songs on Blond. James Blake played keyboards on Blond's "Solo" and its reprise, "Skyline To," and "Godspeed." Malay also returned to contribute production, keyboards, and guitar work. To dive into the specific instruments, let's start with Ocean’s electric pianos, which are littered all over Blond and are one of his most frequently used sounds. Ocean has owned a Wurlitzer since at least 2012 and likely uses it for accompaniment when songwriting. There are plenty of Wurlitzer software instruments, both sampled and emulated, including the Arturia Wurli-V. Although the surface controls are minimal, this plugin allows you to open up the back panel to dive in and edit the tonal characteristics of the instrument. I've used a dark-sounding Wurli patch to emulate Ocean's Wurlitzer tones, as used on "Good Guy" and "Crack Rock." The dual tracks "Be Yourself" and "Facebook Story," which share an electric piano line, sample a Buddy Ross original song titled "Runnin Around," apparently an old demo that Frank sampled for use on Blond. "Runnin Around" was likely recorded on a Fender Rhodes electric piano, a much brighter instrument than the Wurlitzer. Arturia has a Fender Rhodes software instrument called Stage-73 V that can be used to cook up Rhodes sounds. I used the gritty "Stage Amp" preset run through a lot of reverb to create a patch similar to the one in "Be Yourself" and "Facebook Story." The Dave Smith Instruments Prophet-6 makes several appearances on Blond, likely contributed by Buddy Ross. Additionally, the synth on "Thinkin Bout You" from Channel Orange strongly sounds like it came from a Prophet synth. The Prophet-6 is a modern tribute to the classic Sequential Circuits Prophet-5, which Arturia modelled in its Prophet-V. The "Thinkin Bout You" synth utilizes envelope modulation of the filter to create a rising and falling resonant sweep. Set up a two-sawtooth oscillator patch and lower the cutoff frequency to around 100Hz, then set the filter's resonance and envelope amount to around midway to start modulating the filter with the envelope. The resonance emphasizes the filter cutoff point and has a noticeably electronic sound, and the envelope amount controls how much the filter will move. How you set up the ADSR envelope will control the speed that the filter rises and falls. Set both attack and decay to around 1000ms, and set the sustain high enough that the sound doesn't completely fade out after the decay phase. The synth in "Nights" makes creative use of the pitch wheel to create a dramatic sliding effect between chords. Most synths allow you to specify the range you'd like to vary the pitch by, and you can set it to an octave (12 semitones) to create striking rises and falls throughout the register. Fully turn the pitch bend wheel on your synth or MIDI controller as you change chords to slide up or down an octave. You can do this quickly to create a short "grace note" effect, or slowly to create a detuned effect suitable for psychedelic music. The synth in "White Ferrari" is credited to Buddy Ross and was recorded on a Roland Juno-106. The patch employs LFO detuning, a closed filter, and the Juno's legendary onboard chorus effect. A faithful software emulation of the Juno-106 is TAL U-NO-LX, and we can start creating the "White Ferrari" sound by setting up a sawtooth and square wave patch, with PW mode set to LFO and the fader set to the 9 mark. Pull the cutoff frequency down to halfway and lower keyboard tracking (KEYB) to 8, which will change the filter frequency relative to the note played. Set LFO rate to a slow 4 and add some subtle detuning in the oscillator section by raising LFO to around 1.5—keep this subtle, or it'll sound out of tune. Run the patch through a reverb with the mix set very high to make it sound surreal and dreamy. The song, as with much of Ocean's work, is carefully layered. If you listen to his albums on high-quality headphones, you'll notice lots of background elements. It's hard to accurately identify what's going on in the background of "White Ferrari," but to my ears, I can hear a synth choir and a single-note synth line. I used the new Arturia CMI V on its default patch for the choir. Ocean's sound also utilises the Moog Voyager, a monophonic synth that excels at basslines, leads, and arpeggios. We can hear it on Channel Orange’s "Pyramids," where it plays the groovy bassline after the first drop. In Arturia Mini V, set up a patch with three sawtooth waves tuned to 8', 16', and 32'. Then, lower the filter cutoff to halfway. Raise the amount of contour to 2 and set the filter decay to 550ms, with sustain at 2. Turn Legato on and set glide time to 4, which will make the notes slide into each other when played legato on the keyboard. This is a great way to add some funk to your synth-bass lines. The synth in "Nikes" utilizes sine wave oscillators to create an ultra-mellow sound. Plenty of synths offer sine wave oscillators, with one powerful digital synth being XFer Serum, a modern wavetable synth capable of using different wavetables, which allows for some interesting results. Set up a patch with two sine wave oscillators (Basic Shapes and Analog_BD_Sin both sound great) and pitch one up an octave. We'll beef up the number of sine waves by using the unison/detune function. Turn both oscillators’ unison voices up to 5 and set detune to 0.08, which will add more voices and tune them all slightly different, considerably thickening up the sound. Bring the filter down to mellow out the sound and add some movement from an envelope with an attack of around 210ms. Run the patch through some subtle chorus and a large reverb effect with the mix around 50%—the onboard effects in Serum are perfect. About the Author: Dan Carr runs Reverb Machine, a website dedicated to exploring "the wonders of synthesizers and music production." Check out his site for more breakdowns of popular artists' use of synths and unique recording techniques. 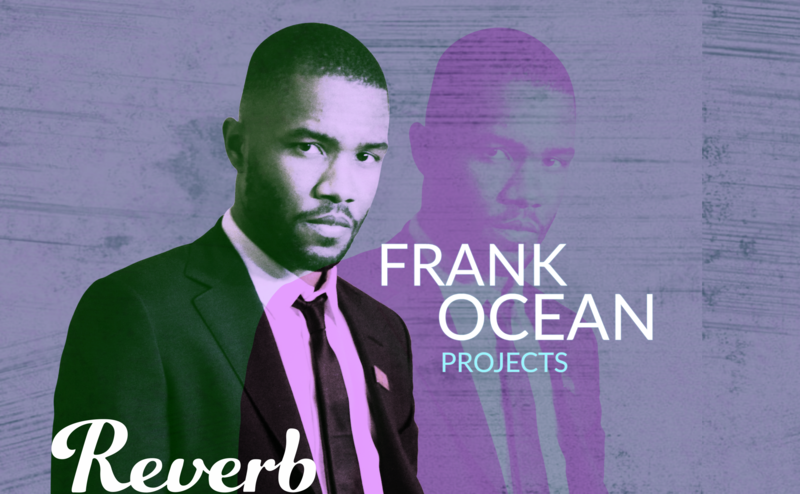 Below, you can download all of the patches Dan used to create these Frank Ocean sounds, as well as Ableton Live sessions for each track.